If the hijackings of September 11 were staged, the organization responsible would also be sure to add other elements to the basic plan, not only developing lists of hijackers, but sending fake cellphone calls from some of the passengers. The following analysis focuses on Flight 93, from which more alleged cellphone calls were made than from the other three flights combined. It could be called the “Cellphone Flight.” Like the staged attacks themselves, the calling operation would be complex, involving the a) deployment of voice mimicry techniques, b) gathering personal intelligence on at least some of the passengers, c) coordination of calls with the operation’s timeline. Any analysis of the cellphone and “airfone” calls from Flight 93 must begin with some basic, high-altitude cellphone facts. According to AT&T spokesperson Alexa Graf, cellphones are not designed for calls from the high altitudes at which most airliners normally operate. It was, in her opinion, a “fluke” that so many calls reached their destinations. In the opinion of a colleague of mine who has worked in the cellphone industry, it was a “miracle” that any of the calls got through from altitude. (See the recent proposal to install equipment to make cellphone calls possible from aircraft.) An aircraft, having a metal skin and fuselage, acts like a Faraday cage, tending to block or attenuate electromagnetic radiation. One can make a cellphone call from inside an aircraft while on the ground because the weakened signal is still close enough to the nearest cellsite (relay tower) to get picked up. Once above 10,000 feet, however, calls rarely get through, if ever. The cascade problem is more likely at altitudes of 10,000 feet or lower, where reaching a cellsite, although still a touch-and-go matter, is more easily accomplished. However, because of its superior position, the cellphone may reach several cellsites at once. This can create problems, as software that determines which site is to handle the call makes its judgment based on the relative strength of calls. If the call is made from an overhead position, it may well not be able to distinguish relative strength at different cellsites. When this happens it is designed to close off the calling channel, selecting another channel in its place. But the same problem of deciding which cellsite should handle the call also occurs on the new channel, so the new channel is closed, and so on. One by one, in a rapid cascade that would last only seconds, all the channels would be closed, leading to a network-wide breakdown. As I have pointed out elsewhere, cellphone calls from commercial aircraft much over 8000 feet are essentially impossible, while those below 8000 feet are highly unlikely down to about 2000, where they become merely unlikely. (Dewdney 2003) Moreover, even at the latter altitude (and below), the handoff problem appears. Any airliner at or below this altitude, flying at the normal speed of approximately 500 mph, would encounter the handoff problem (Dewdney 2003). An aircraft traveling at this speed would not be over the cellsite long enough to complete the electronic “handshake” (which takes several seconds to complete) before arriving over the next cellsite, when the call has to be handed off from the first cellsite to the next one. This also takes a few seconds, the result being, in the optimal case, a series of broken transmissions that must end, sooner or later, in failure. It must also be remarked that the alleged hijackers of the Cellphone Flight were remarkably lenient with their passengers, allowing some 13 calls. However, it would seem highly unlikely that hijackers would allow any phone calls for the simple reason that passengers could relay valuable positional and other information useful to authorities on the ground, thus putting the whole mission in jeopardy. The following analysis of the actual calls is based on text assembled by four reporters of the Pittsburgh Post-Gazette. (Roddy et al. 2001) The calls were mostly rather brief and it must be borne in mind that, with the exception of two recorded messages, the persons called would not necessarily recollect the exact words which either they or the caller used. The caller went on to describe Arabic-looking hijackers wearing red headbands and carrying knives. One had told the passengers he had a bomb. The caller asked if it was true that planes had been crashed into the World Trade Center. She confirmed this. The caller mentioned that another passenger had heard the news on his/her cell phone. CALL A2: The man claiming to be Tom Burnett called Deena Burnett again around 9:30 am. As Deena later described his call, “He didn’t sound frightened, but he was speaking faster than he normally would.” He told her there were hijackers in the cockpit. Alice: “Who are these guys? Caller: (after a pause) “You believe me, don’t you? Alice: “Yes, Mark. I believe you. But who are these guys? CALL D: A man claiming to be Todd Beamer on a United Airlines airfone had some trouble getting through to anyone but the Verizon customer service center, where the operator relayed the call to Verizon supervisor, Lisa Jefferson at 9:45 am. (Verizon is a large communications company that has the contract for airfones on United airlines equipment.) The man told Jefferson that the plane had been hijacked, that he could see three hijackers armed with knives, one of them claiming to have a bomb. He described how the passengers had been herded to the rear of the aircraft, guarded by the one with the bomb. He asked the supervisor to call the Beamer family on his behalf. CALL A3: The man claiming to be Tom Burnett called Deena Burnett again. CALL F1: At 9:47, the answering machine of Lorne Lyles recorded a call that he thought was from his wife, CeeCee. The woman could be heard praying for herself, her family, and even for the souls of the hijackers. CALL B (cont’d.) State police, talking to Jeremy Glick’s mother-in-law, asked her to relay a question to Jeremy. Did he know where his plane was? He didn’t know, but said they had changed direction. He told Ms Lyles that the passengers were about to take a vote on whether to take back the aircraft. Should they try? Lyz: “Honey, you need to do it.” They spoke of weapons. The caller joked. CALL G: About this time, Phil Bradshaw, husband of flight attendant Sandy Bradshaw, received a phone call from a woman who identified herself as his wife. Caller: “Have you heard what’s going on? My flight has been hijacked. My flight has been hijacked by three guys with knives. Phil asked her who was flying the plane. The caller then explained that she had to go. She planned to prepare boiling water in the galley — to pour on the hijackers. She asked Jack to pass along her love for everyone, then passed the airfone to her seat-mate. CALL J: Esther Heymann received a call from a woman claiming to be her stepdaughter, Honor Elizabeth Wainio, also Grandcolas’ seat-mate. Wainio said she could feel them. CALL A4: Once again, just before 10:00 am, Deena Burnett received a fourth phone call. CALL F2: The caller identifying herself as CeeCee Lyles finally got through to Lorne Lyles. As the couple prayed together, Lorne heard sounds that he would later interpret as passengers preparing a counterattack. CALL D (cont’d): Having finished his prayer session with Lisa Jefferson, the caller claiming to be Todd Beamer left the phone connected. Jefferson recalls hearing the now famous rallying cry. CALL J (cont’d): Esther Heymann, who believed herself to be talking with her step daughter, heard her last words. CALL G (cont’d): Phil Bradshaw heard his caller’s last words to him. CALL F2 (cont’d): Lorne Lyles recalls hearing the last moments of Flight 93. Caller: (screams) “They’re doing it! They’re doing it! They’re doing it! The caller screamed again, said something he couldn’t hear, then the line went dead. How on Earth could any organization fake the calls I have just described? In the middle of writing this very sentence, I was interrupted by someone calling through the back door of our porch: “Is anybody home?” It was my son who was visiting us from out of town. He had been out with some old friends. I went out to the back porch to greet him. It wasn’t my son at all, but the neighbor next door wanting to borrow our ladder. I marveled that I could have mistaken his voice for that of my son. It has a different timbre and tone, yet the context of expectation overrode my ability to discriminate sounds. One could say that my neighbor faked my son’s return without even trying to. This example proves nothing, of course, but it illustrates a fact that has been used by spiritualists and mediums to beguile clients for hundreds of years. Anxious people, hoping to contact a deceased loved one, would typically report satisfaction with a seance. “I swear, it was my son. There was no mistaking that sweet little voice.” The context leads the recipient of such a message actually to hear the loved one. Of course, the tone of voice must be approximately correct. In the case at hand, persons faking phone calls have the further advantage of electronic fuzzing, the tendency for audio lines with very low bandwidth to transmit the human voice somewhat imperfectly. In addition, extreme emotional stress alters the human voice even more markedly, causing the person addressed to make unconscious allowances. Telephone calls all have low bandwidth which simply means that many of the characteristics of the human voice are simply lost, like an out-of-focus photograph; if you know that the picture taken at the lake last summer was of your sister, you will have no trouble “recognizing her. Yet if someone who somewhat resembles your sister, wearing the same clothes had stood in for your her, you would still “know” that it was your sister. There are three ways to fake the telephonic voice of any person whatever. First, voices can be mimicked. With a little practice, you or I can sound like a great many people. Second, voices can be synthesized in near real time if one has a recording of the voice being recorded. Software that was already well developed before September 11, 2001, was able to produce a very convincing quote from General Colin Powell of the Joint Chiefs: “I am being treated well by my captors.” (Arkin 1999) Moreover, the mimicry is convincing even when played over a high bandwidth device such as a tape recorder. The third way involves a device called a voice transformer or a voice changer, such devices having been under development for at least a decade. (Ex. Pro 2004) (Spook 2004) (SeeStorm 2004) One speaks into a microphone, the sound pattern is digitized and, in real time the computer within the device produces a signal that is reconstituted as sound, a voice that can be entirely different from your own. Everything you say will be spoken by the synthesized voice and with the same inflections, pauses and emphases. You can transform your voice into that of an old man or a young girl. You can alter the sound of the voice so produced by changing the settings of controls that govern pitch and voice formants, the overtones that make up what might be called the specific “sound” of a particular person’s voice. Of the three methods of faking a particular voice over the telephone, method number three is obviously preferable. However, it was the content of the alleged cellphone calls that caught the attention of the American public as confirming that the calls had been made as alleged. The caller seemed to know at least a few “personal details” about the person being called. As far as we can determine, these details involved the pet name for one’s partner, as well as other commonplace items such as references to “the kids,” and so on. The question therefor arises how the caller could have known these details. There are at least two ways. First, several passengers aboard Flight 77 were undoubtedly frequent flyers. Agents taking the flight on several occasions prior to September 11 would have an ample opportunity to engage numerous fellow passengers in chitchat, meanwhile recording their voices. Of course, the organization involved would have obtained copies of the flight manifests well before the flight or it could have simply eavesdropped on the phone reservation systems for American and United Airlines. On the fateful day the calling operation would take place in an operations center, basically a sound studio that is equipped with communication lines and several telephones. An operations director displays a scripted sequence of events on a screen so that the voice operators know what stage the “hijacking” is supposed to be at. All calls are orchestrated to follow the script. For example, shortly after the takedown of Flight 77, (See Dewdney 2003b) the first bogus calls from Flight 77 are made. Other pseudo-events in the script include the first appearance of the hijackers, their announcement, scuffles with passengers, the back-of-the-plane strategy session, and the final rush to the cockpit. It would also include real events such as the aircraft’s turn mentioned in Call D.
To supplement the calls with real sound effects, an audio engineer would have several tapes ready to play. The tapes, which portray mumbled conferences among passengers or muffled struggles, replete with shouts and curses, can be played over any of the phone lines, as determined by the script, or simply fed as ambient sound into the control room. Trained operators with headsets make the actual calls, talking into voice changers that have been adjusted to reproduce the timbre of voice for every passenger designated to make cellphone calls. 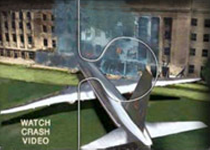 Each operator has studied tapes for several of the individuals, as recorded on prior occasions of Flight 93, as well as profiles of the individuals, including many items of personal information, obtained by he methods previously explained. The introductory sentence would carry the hook: “Honey, we’ve been hijacked!” Thereafter, with the belief framework installed, the operator can react to questions, literally playing the situation by ear, but being sure to include pertinent details such as “Arab-looking guys,” “boxcutters,” and all the rest. If the contact has been made successfully in the operator’s opinion, with the essential information conveyed, it is always possible to terminate the call more or less gracefully, depending on what portion of the script is under execution. “Okay. We’re going to do something. I’ll call you back.” Click. Operators would have received general instructions about what do to in the course of a call. Although each has been supplied with at least some “intimate” details of the target’s life, there would be techniques in place for temporizing or for avoiding long conversations where basic lack of knowledge might threaten to become suddenly obvious, and so on. Three such techniques are praying (from text, if necessary) (Calls D, F1, and J), crying (as in call H), or discussing the other attacks (as in call A2 and B). In the case at hand, Flight 93, various calls may now be examined as a consistency check. First, it must be noted that the longest call was made by the person who identified himself as Todd Beamer (Call D) to someone whom the real Todd Beamer did not know at all, Lisa Jefferson, a Verizon supervisor. Among the shorter conversations were Calls B, A2 and D.
This is strange because it implies that the caller had already finished breakfast, whereas meals are not normally served until the aircraft reaches cruising altitude, about the time that the alleged hijacking began. In Call A2 (Burnett), Deena Burnett describes the other hijackings. Here, the caller seems to be temporizing. Not only are hijackings of commercial (i. e., cargo) aircraft extremely rare events, the caller’s apparent surprise contradicts the implication of Call B (made earlier) that the other attacks were already general knowledge among the passengers of Flight 93. Call C, also short, may point to a possible fumble. Was one of the callers asleep at the switch? Caller: “Yes, Mark. I believe you. But who are these guys? Alice Bingham attributed the strange introductory sentence to her son being flustered. But if Mark chose his mother to call, over all other people in the world, would he be likely to make such a mistake? Would thoughts of his mother not be uppermost in his mind, no matter what happened in the passenger compartment? A caller can only make such a mistake if he or she is thinking of something entirely unrelated to the reason for the call or the person being called and that can hardly have been the case in the alleged circumstances. Instead of answering the mother’s question, the caller seems uncertain. Mrs. Bingham has just asked “Who are these guys?” and the caller answers with another question. Does she believe his previous sentence? The caller, who may have lost confidence in the call, terminates the conversation (possibly pounding his forehead in silent frustration). Caller C never called back. Of the 13 phone calls allegedly made from the plane, four were from one caller (A: Burnett), two were from another (F: Lyles), and the remaining seven calls were not repeated. Non-repeated calls would thus represent final exits with either flubbed results or a smooth performance. The repeated calls give continuity to the script, as well as opportunities for myth-building. Here’s Todd Beamer, known to friends (and observers) as a kind of go-ahead, take-charge guy. Perfect. He will be the “reason,” decided well in advance of September 11, why the plane crashes well short of the White House. Caller D, the one alleged to be Todd Beamer, apparently had difficulty using his airfone. This could be explained if the telephone used by the caller was not part of the Verizon system. However, the caller could easily access the Verizon supervisory office over an ordinary telephone, explaining that he had been trying to reach someone. Strangely enough, caller D preferred to talk to Lisa Jefferson (asking her to call his loved ones for him), even though he was about to die. The Olson call is neither less nor more mysterious than the calls previously analysed. In this case it might be asked what advice Ted Olson could possibly have for the pilot (who was allegedly at the back of the plane with the passengers). The foregoing analyses certainly do not prove that the cellphone operation actually took place. But they clearly demonstrate that all the conversations are consistent with such an operation, along with a sprinkling of tantalizing clues that are more consistent with the operation than actual in-flight calls. That is all one can hope for from such an analysis, even if the alternate scenario is correct or approximately correct. Under the weight of evidence that the cellphone (not airfone) calls were essentially impossible as described by the Bush White House and the major media on the day in question, we have no alternative but to give serious consideration to the operational possibilities, as outlined here. (Fraizer, 2002) Fraizer J. How do I log on while in flight? North American Network Operators. (June 27 2002)<www.irbs.net.internet/ nanog/0206/ 0907.html>. Retrieved Sept. 3, 2002. (Roddy et al., 2001) Roddy DB, Lash C, Levin S, and Silver JD. Flight 93: Forty lives, one destiny. The Pittsburgh Post-Gazette. Oct 28, 2001. See also <www.post-gazette.com/headlines/ 20011028flt93mainstoryp7.asp>, Retrieved August 24, 2002. (Spitzer, 1987) Spitzer CL. 1987. Digital Avionics Systems, New York, NY: McGraw Hill. (WRH 2004) Is Israel Blackmailing America? What Really Happened. Retrieved June 10/04 from <www.whatreallyhappened.com/blackmail.